France, 1981, 81 minutes, Colour. 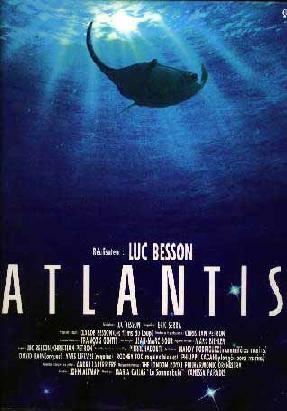 Atlantis is a cinema poem, cinema symphony, written and directed by Luc Besson, director of such films as Subway, Nikita. He also made The Big Blue, and, attracted by underwater photography, he decided to make Atlantis. It was three years in the making, Besson said he wanted it to be an underwater opera, a tribute to the sea, pictures and music. He wanted audiences immersed in the pure mediated splendour of sensation. The film shows the beauty of life under water - as well as grim reminders of the destructiveness of the eco systems under the water. The locations include the Galapagos Islands, New Caledonia, The Seychelles, The Great Barrier Reef, British Columbia, Florida, The Bahamas, The North Pole, under water colour photography is outstanding. The score from Eric Serra - and vocals include and the film is paced with, intelligence and humour, the action of the underwater fish which brings the vibrancy and vitality of life underwater. The film is a wonderful tribute to creation, of being immersed under water in an exhilarating and beautiful way. 1. The impact of the experience? The documentary style, cinema poem, symphony? 2. The work of Besson, his action thrillers, avant garde styles, the experience, The Big Blue? 3. The range of locations, the worldwide waters and underwater? The beauty of nature? The elements of human destructiveness? 4. Wide screen photography, the musical score, the sounds and the effects? the 'Maria Callas aria? 5. The experience of the action being only underwater - with the final emergence from the water and looking down on the sea and its surface, covering such wonders? A world under water? 6. The range of sea scapes: the shallow waters and looking up at the sun, being underneath waves, rock formations, the depths, underwater caves, the planes and the vegetation, the deep canyons, coral and trees and bushes? 7. The range of fish, shapes and sizes, colours, movement, speed, languid movement? The crowds and schools of fish? The single fish? The large and small, the quaint and the ancient? Seals and penguins, walrus? The sequences with the sharks? The octopus, the dolphin? The stingray and the opera? The variety, and beauty? The elements of nature red in tooth and claw - and rhe destructiveness of the sharks? 8. The parallels with human behaviour and that of the fish, crowds, the opera performance, the audience and their response, food, sexual encounters and copulation, the prowling on prey, the taste of blood? 9. The overall impact of the cinema poem - and the echoes of the title and the lost world of Atlantis under the water?